Cast your mind back a couple of days*: we had a Martin-approved elfin face for Maud, the mad, magic-wielding princess, and a body to go with it. Next steps? Get the head and body together, ink them up, and scan them. To start the process, and despite my dreadful experience with mashing Queenie's features onto Maud's face, I simply stuck the approved-of head onto the body using Photoshop. I then printed it up, took it over to my lightbox** and traced it in pencil. I tend to do this with all the images that I'm going to ink -- I like to keep the original un-inked so that I can go back to it and start again if necessary. Then this tracing got inked with a brush pen (I use a Pentel one that takes a fountain pen style cartridge), then the inked version was scanned, and finally the scan went through its first basic edit in Photoshop. Above to the left you can see the inked version just as it was when it was scanned. The middle version has had its colours selectively altered to bump up the black and clean up the white***, and the right version has had some additional editing done to prepare it to be imported into Illustrator. For this stage of editing, what I'm generally aiming to do is clean up any unwanted ink blobs, fill in any areas that didn't quite get inked as they should have, and tidy up anything that, on second glance, doesn't work the way I wanted it to -- so, for example, I erased a curl at the bottom right of Maud's hair, because it took away from the general right to left swoosh that I was trying to get, and I erased some of the catch-light detail at the end of her nose, because it looked too busy. But the main thing I'm doing at this level of editing is adding and deleting pixels. When I'm all done with my editing in Photoshop, I'm going to import my image into Illustrator and use Live Trace to turn it into a vector image, so that it can be manipulated without losing any detail****. However, in its default settings Live Trace does have a tendency to treat white or grey space in the middle of a line as "no line here," and to treat the slight wiggles you get at the edge of a pen line due to the texture of the paper, as "give the line a big, poky-out bit here." Above left you can see a scan (enlarged) of a pencil sketch (it's Maud's hair), and above right is the result if you try to Live Trace the sketch without doing anything to it. Interesting, but really not the look we're going for. So, in I go with my tiny eraser tool, zoom right in to the picture, and knock the pointy edges off the lines. Then I go back with my tiny pen tool and fill any gaps in the lines. Before I do all that, the image looks like the line above left; once I've finished my pixel editing, the image should be like the larger black shape to the right (that's a zoomed-in bit of Maud's sleeve, by the way). I don't edit every line this way -- some lines you want to look scratchy and incomplete, like the shading on Maud's arms -- and you do have to go carefully to ensure that you don't lose the hand-inked look. Then I select the lot with Photoshop's Lasso tool, and copy and paste it into a new Illustrator document. After Live Tracing and Expanding, I can then select different elements of the image and drop colours into them. Well, in principle I can do this. In practice things sometimes get complicated. The main complication with Maud was that I had coloured in her hair when I was inking. 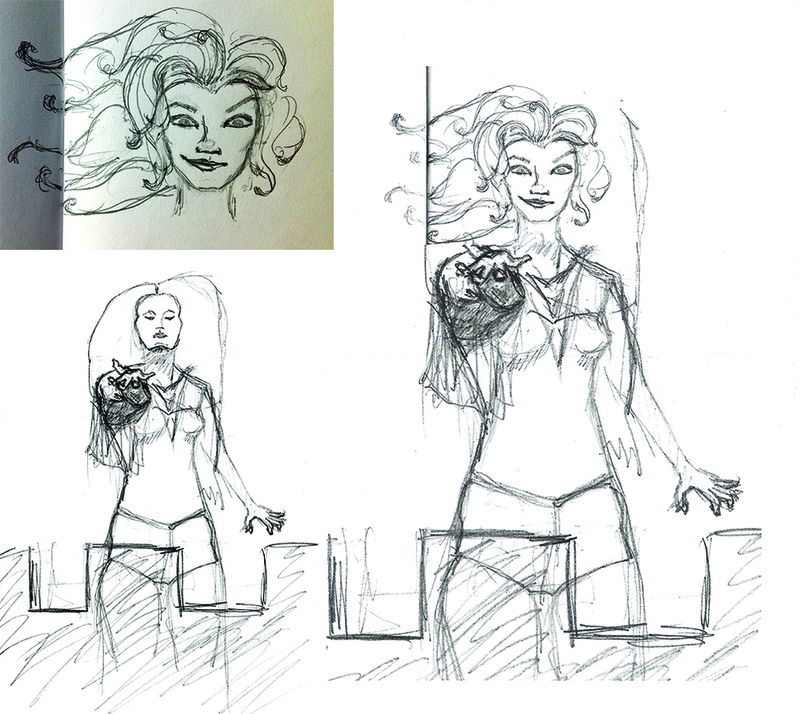 That meant that, in Illustrator world, her hair was part of the outline of her body, and couldn't be selected without selecting all the lines that touched her hair as well (likewise the parts of her eyes that needed to be green, which couldn't be selected without selecting the rest of her eye). The quick-and-dirty solution to this (I'm sure someone out there will have a more sophisticated idea I could try) was for me to make a copy of Maud's head and hair and erase all the elements except for the parts I wanted to colour: her hair, eyebrows and the irises of her eyes. I could then safely colour this copy, and layer it over the original image without worrying about affecting the rest of the picture. Then all you have to do is place Maud carefully on a background and surround her by swirls of magic, and she's good to go! Check out Swords Versus Tanks Episode 1 and Episode 2. It has Swords! And Tanks! And the beautiful and slightly unstable Maud! * Yes, I know, I know, I said I'd finish the post "tomorrow." Man, you people are impatient! ** A spare drawer from an Ikea wardrobe, filled with LED light strips, with a sheet of plexiglass/perspex laid across the top. *** In Photoshop: 1) ensure your image is in RGB mode; 2) Image > Adjustments > Selective colour: select white and decrease the amount of black in the white to -100%, then select black and increase the amount of black in the black to +100%; 3) Image > Adjustments > Curves: move the sliders at right and left towards the middle until the desired level of contrast between the black and white has been achieved. **** There are other ways to vector-ise (is that a word?) an image; Live Trace is quick and undemanding, which is important when you need your brain for other things, like trying to figure out how to get 24 Vikings onto the back of a Zeppelin.